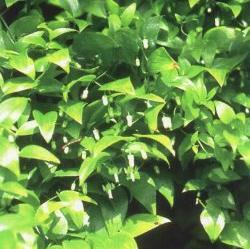 Scrambling or twining perennial that grows up to 3 m tall in supporting shrubs or hedges. The 'leaves' are actually green, flattened cladodes that resemble leaves. Flower small, greenish-white, followed by red berries. Flowers Greenish-white, 5-6 mm long, singly or in pairs in the leaf axils. Flowers July-Aug.
Fruit Round red berry, 6-10 mm in diameter. Two to eight black seeds, about 2 mm in diameter. Leaves Light green cladodes (green, flattened stems that resemble leaves), solitary at each node, 10-35 mm long by 4-15 mm wide, flattened, ovate, pointed, with about seven prominent veins. 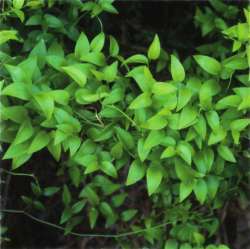 Stems Tortuous, green or slightly woody and brownish up to 3 m long, branches spreading, rough angles. Roots White, fleshy, tuberous, in dense underground clusters. Hedges, coastal slopes, road-side banks and abandoned quarries. Common in the northern half of NI, diminishing southwards. Found at Kerikeri and Dargaville in North Auckland, Auckland, Hawkes Bay (Napier) and in the Manawatu. In SI at Nelson City, Christchurch and Banks Peninsula. Originally from South Africa. Asparagus (Lat.) = asparagus; asparagoides (Lat.) = asparagus-like.